My love for hydrangeas is a love story for the ages. There is just something about Hydrangeas that are just so perfectly flowericious. See? A love so strong I start inventing new words! And don’t get me started on their amazing color variety. Oh, hydrangeas, how I love thee! It is no family secret that I like expensive things, and that without knowing prices, I can pick out the most expensive thing anywhere just by picking out the thing I’d like to have. It is very convenient that I have always been a saver too and my love for numbers and budgets has saved me/us from many money-disasters. I believe in saving where I can so that I can spend where I want. Personally, I would skip weeks of cheap fast food for a good steak dinner. Makes sense, right? But it can be very tempting when you are in the mode of spending, to just keep spending … just a little more won’t hurt right? My on/off switch for spending keeps us safe. 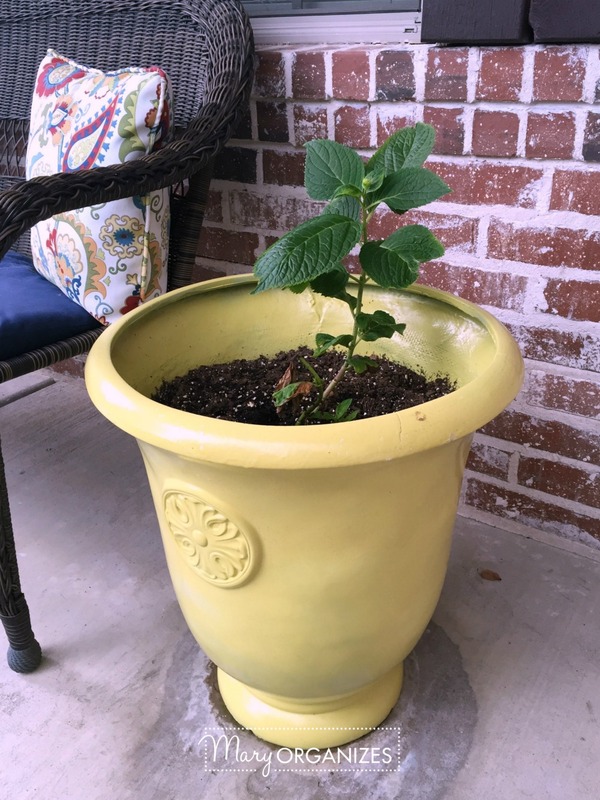 I really wanted to refresh my planters for my front porch, but I didn’t want to spend any money. All of my outdoor budget is going to the new garden right now. I showed you my front porch hydrangeas a few years ago – they were my flower-babies and I loved them! But I didn’t move them into the garage in time for winter, so they just died. The fungus and disease from last year made me nervous to just re-use the same pots, except I love the size and shape of these planters. I decided that the best course of action would be to power-wash them and give them a coat of spray paint. Surely the fungus and disease would not transfer after all of that! Here’s my pots after I power-washed them. I also made sure to dry them really well before I spray-painted. You can tell that one of these spent a while not under the porch! I love the color yellow. Though I refuse to name a favorite color, because I just love COLOR … yellow is one I return to again and again. It is just so fresh and happy. 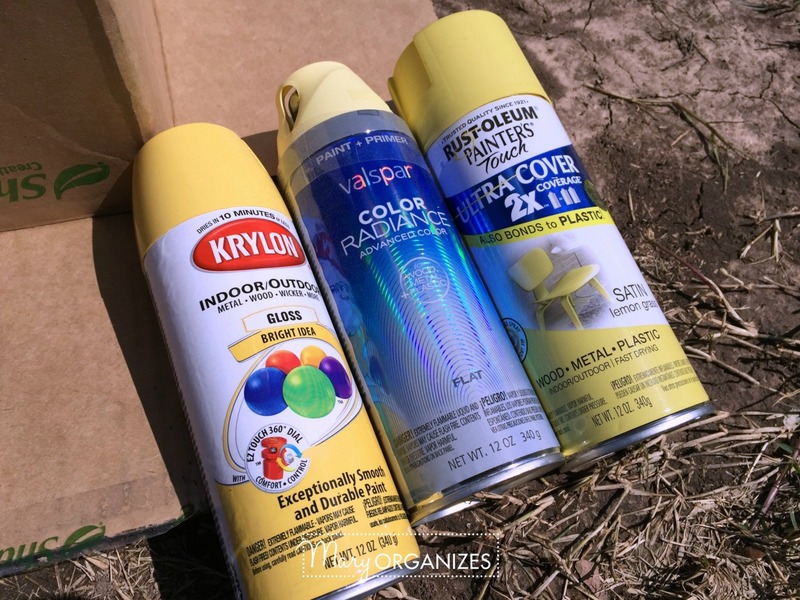 I happened to have 3 partially used spray paint cans of the color yellow. This tied in perfectly with my plans not to spend any money on this project. The first coat of yellow wasn’t enough for that dark green. 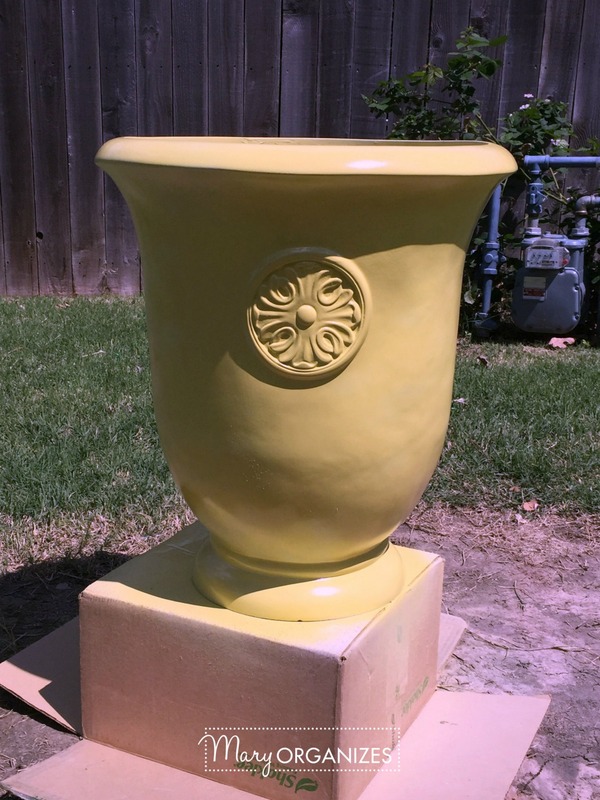 There we go … 2-3 coats later and it is yellow! Now here is where I took a slight detour that I regret in hindsight. 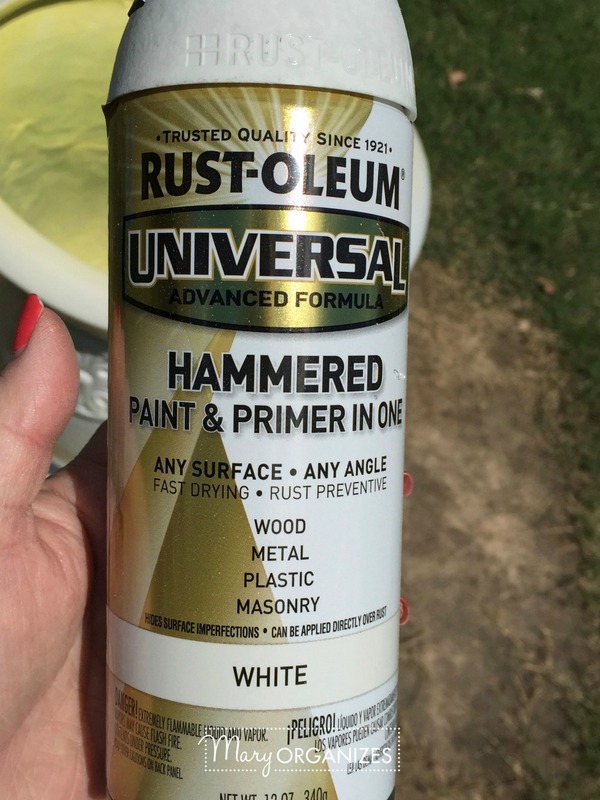 I wanted to see if I could get the yellow to sparkle a bit and I had some of this metallic pearl on hand. I thought I could just kind of mist the spray paint over the yellow, but nooooo … that didn’t look right at all, so then eventually it was all pearl. 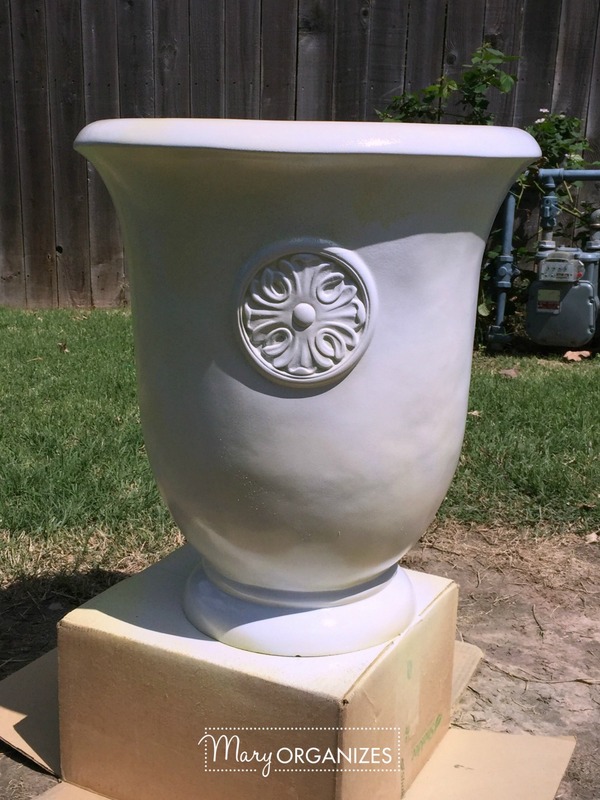 And I never wanted a white planter. 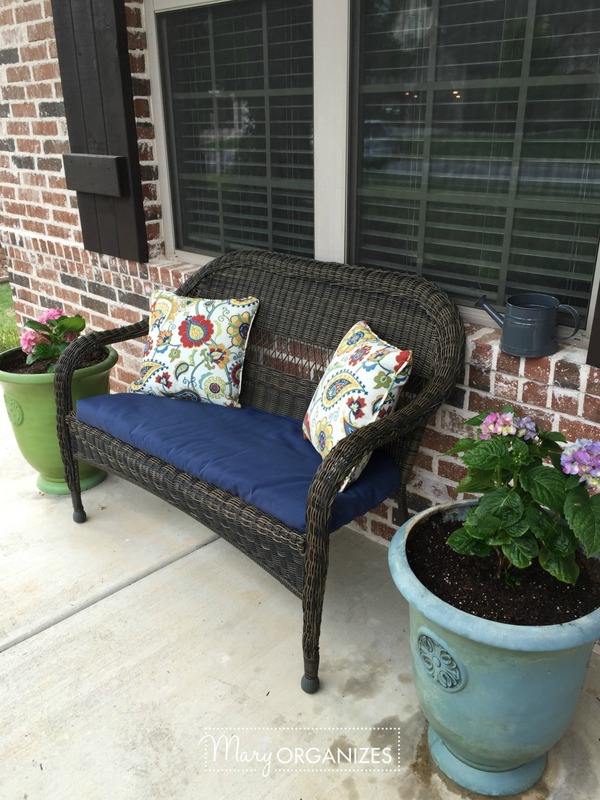 I know some people would love the white planter, but I want a pop of color on my front porch. Luckily I had plenty of the yellow spray paint (though I used every last drop! 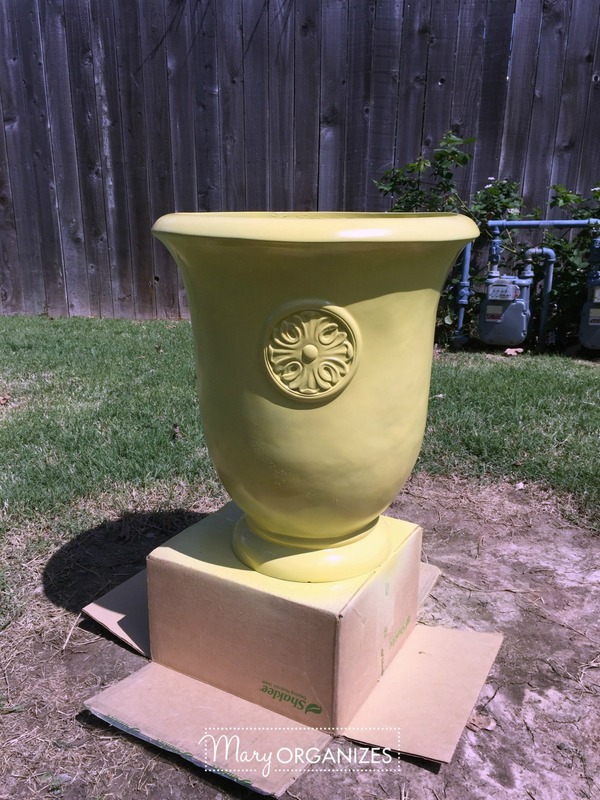 ), and the planter returned to it’s happy yellow. Woohoo!! The planters are totally refreshed. And looking at these pictures now I see how I want to antique the yellow a little … maybe next year, too much to do in the garden this year! As I carried the planters from my backyard to my front porch, I stopped by the side of my house where we have rocks and I scraped some into the bottoms of the buckets. I always put rocks at the bottom of my planters to give them additional stability, but most importantly, to help with drainage. The soil in the planter is garden dirt. I hadn’t planted my garden yet, so the soil was just there for the taking. I also used up a bag of planting soil I found in my gardening stuff that I had forgotten about. Good healthy soil is important. Our garden dirt is a mix of 1/3 peat moss, 1/3 compost, and 1/3 vermiculite. With hydrangeas, I usually add a little acid to the mix as well for blue-er flowers, but I haven’t added it to the planters yet. You can add that on the top of the soil at anytime and watering will carry it to the roots. 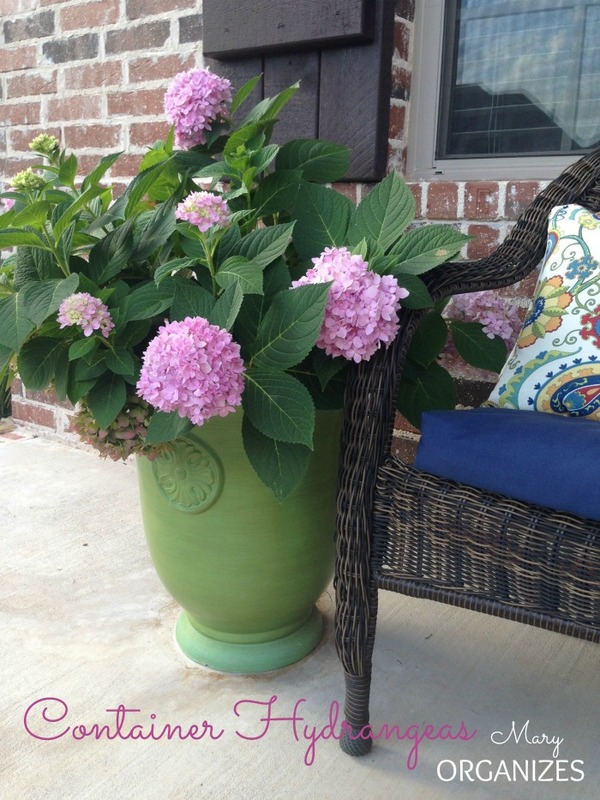 Hydrangea plants can cost a pretty penny each – I’d say at least $20 for a good one! I had been keeping an eye on my hydrangeas in my backyard (that are planted in the ground) this spring and noticing how they were growing little “baby hydrangeas” as I called them. Guess what? 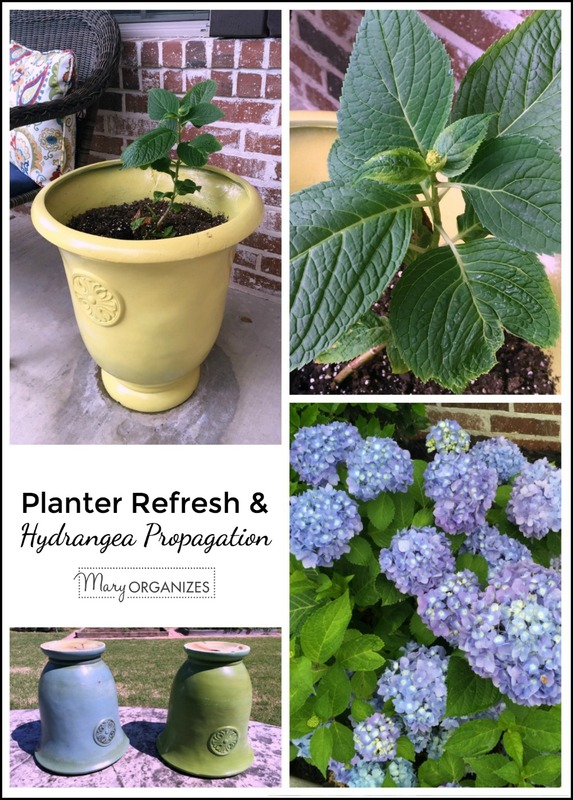 You can divide a healthy hydrangea plant! I just got my garden trowel and dug down from one of these healthy shoots that looked further away from the rest. You need to get as much root as possible and try to get what will feel like a little clump of roots. I read online that it is getting part of the bulb, but I can tell you that it didn’t feel anything like what a “bulb” would look like. I just say get as much root as possible! 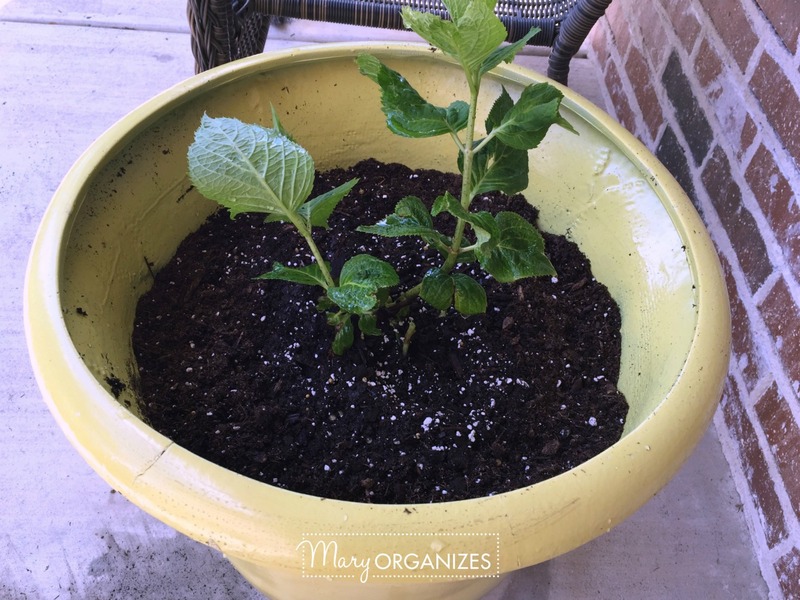 I pulled two hydrangea divisions up and planted them in my new yellow planters. It was still early enough in Spring that I hadn’t pulled my cushions out for the chairs. The hydrangeas have done really well for the last month! They appear to have rooted and I can tell that flowers will be coming soon. I can already see that my new hydrangea is having babies! Part of the original part I planted died off, I’m guessing not enough roots for it, but the main part has done really well. From past experience, I know that healthy hydrangeas, if they are cared for really well can bloom into porch beauties! I can’t wait. I will definitely be updating you (at least on Instagram if I forget to update here)!!! There we go … TWO new feeling planters with thriving hydrangeas and not a penny needed to be spent. Perfect! 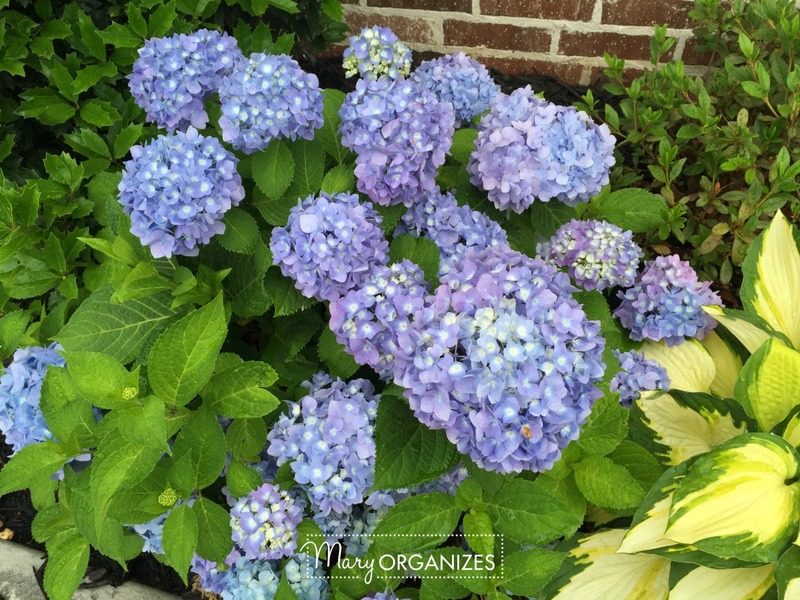 Have you ever divided hydrangeas? 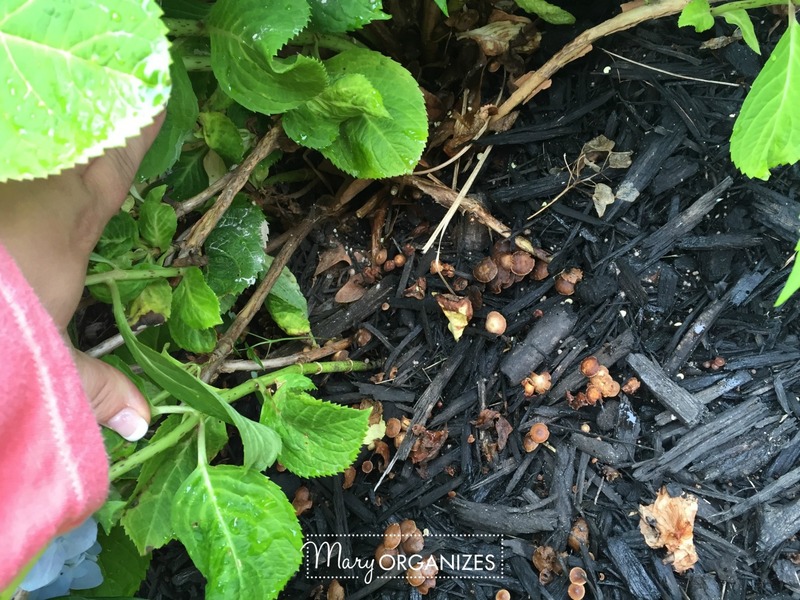 Dealt with garden/landscape fungus – any tips? I’ve just potted up a hydrangea for the front of the house. Am hoping to turn it blue but with hard water here, i suspect that might be difficult. My grandad had a big blue hydrangea in the front garden so they always remind me.of him. Fingers crossed this one survives. I’m not much of a gardener! What do you add to make it acidic? I did hear of adding aluminium sulphage but not sure about that. I buy the acidifier meant for hydrangeas at the store, but I’ve heard of people adding vinegar too. I’ll check at the garden centre next time I’m there and see what they have. Well done!! A very satisfying project. I also have to say, the first 3 paragraphs are equally true for me! I’m in Micigan—- think I can overwinter in garage too?? Not positive – It’s worth a try! Darn! Do you think something could’ve gone wrong or do you think it is just not going to work in Michigan? I LOVE LOVE LOVE Hydrangeas! I just moved to a new house and will be adding some to my new landscape. 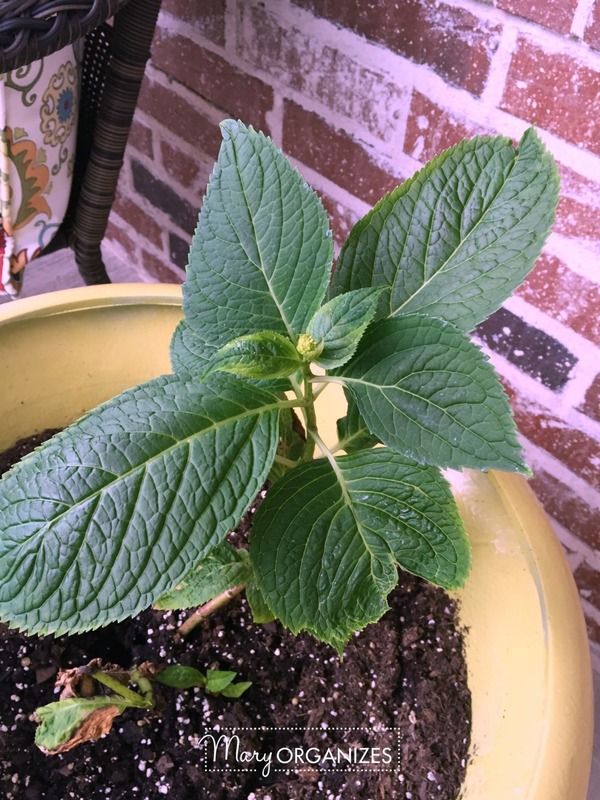 At my last house I had a Unique H, Peppermint H, Endless Summer, and Lace Cap H. My mom has a climbing H that she takes babies off and plants other places. It works like a charm. Good luck with the fungus. I have no clue…. Love them too and you have inspired me! I have one plant in the backyard against the house that I rarely even get to see! Didn’t know I could do the pot thing and overwinter them! Think that will work in the midwest with our cold winters? Or should I put them in the basement? (can I just not water them all winter?) Worst case I can just get new shoots from my existing plant each year. Can’t wait to try this!! Thank you! Oh I’m so glad I inspired you! Yay! Good luck with all of your Hydrangea adventures! 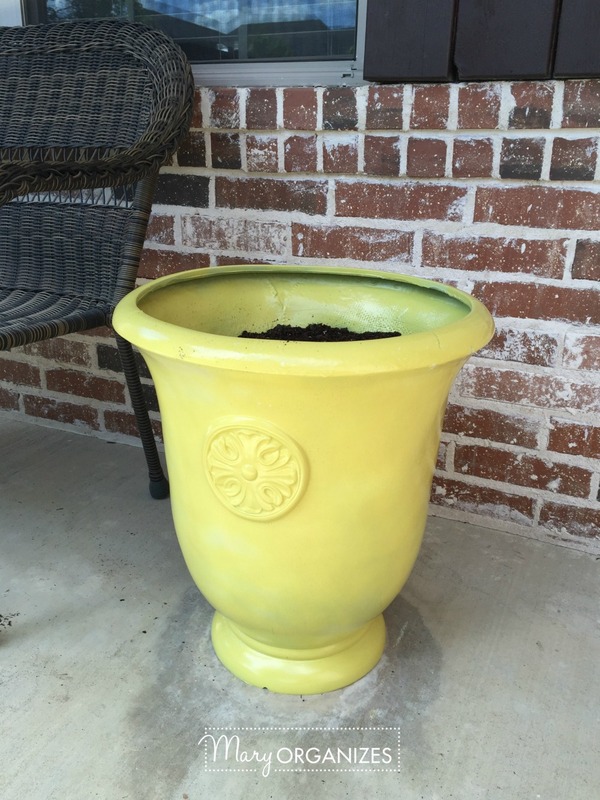 I love your yellow planters! I love to spray paint just about anything 🙂 I have three healthy hydrangeas in the backyard. I’m a fellow hydrangea lover. 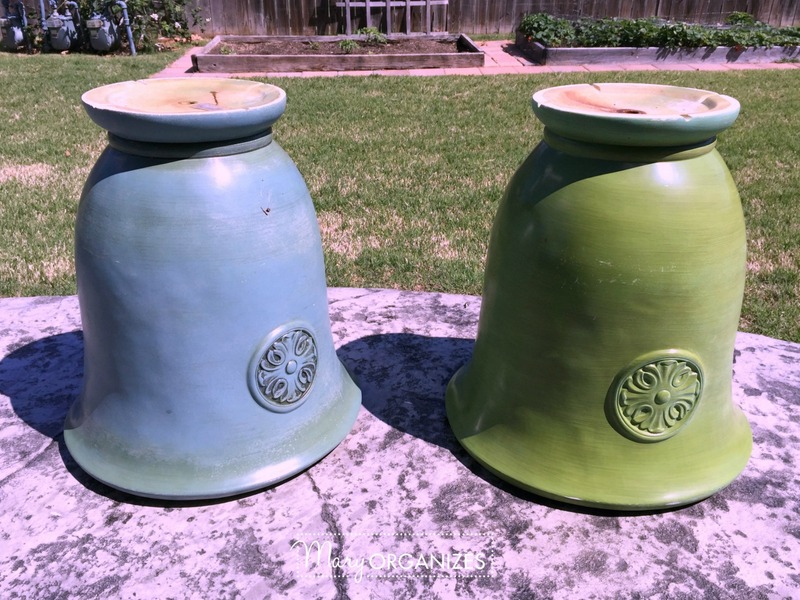 I hadn’t thought of putting them in my urns on my front porch. I’ve always just done ferns. That’s definitely going in the garden notes for next year. Thanks for the inspiration! I love hydrangeas but being in Texas it’s hard to have them here due to the heat. 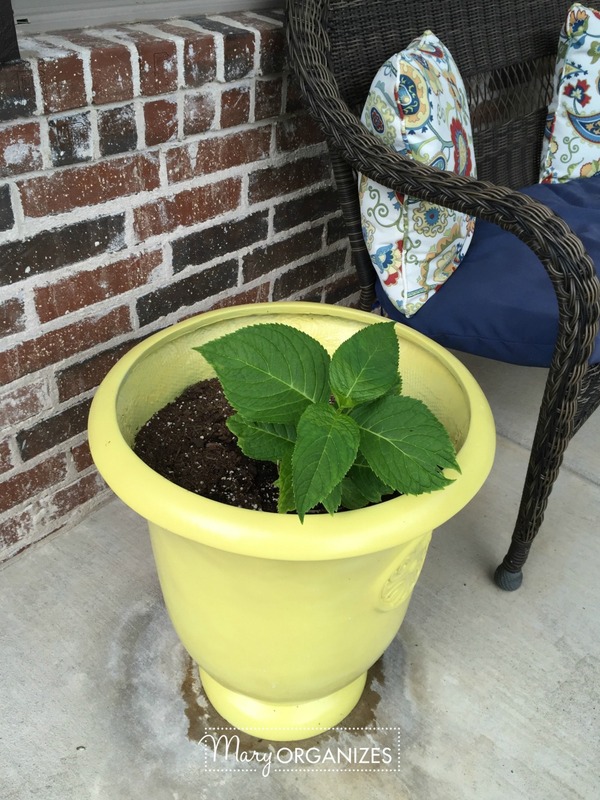 Last year I put a couple in pots and put them on my shaded patio. They looked pretty through the summer then of course died back i the fall. I didn’t do anything with them at all over the winter, just left them out there. No water or anything. They came back this spring and now are just as pretty as ever with tons of blooms on them. I couldn’t be happier. That is fantastic! That means the roots didn’t freeze and die, so they must’ve stayed warm enough in the pots. That is fantastic! Friends – I live in southwest suburb of Chicago and you cannot leave a hydragnea in a pot for the winter. I know this because I did and it died. However, you can attempt to move the pot to the garage and still cover or basement (if you have one). 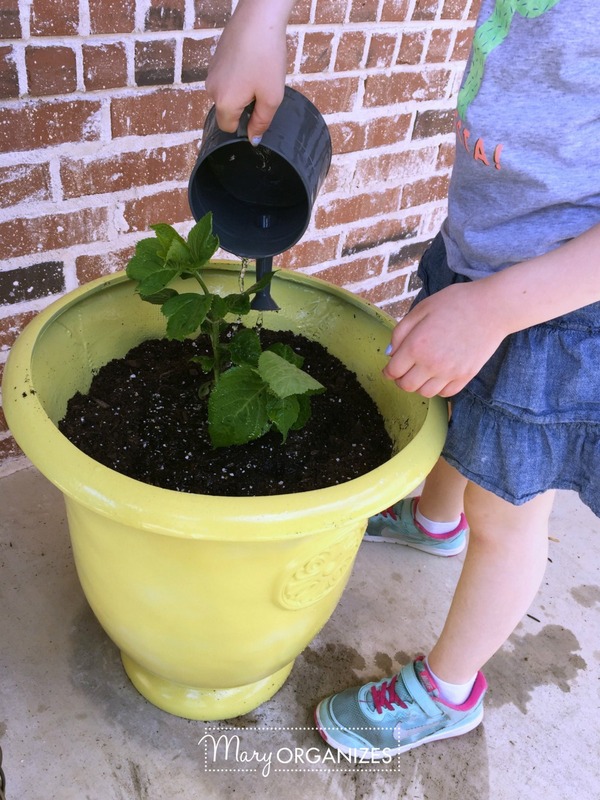 Or still remove the plant from the pot and place in the ground. Just last weekend I was at a yard sale and this woman had a HUGE hydragnea in a pot and she said she puts the plant in the ground come fall and takes it back out and puts in a pot. This plant was huge and so beautiful in its pot. 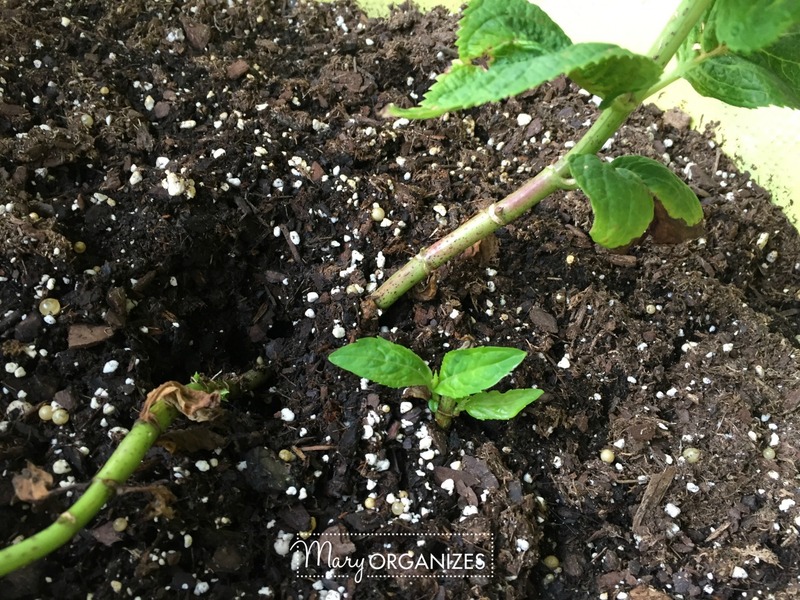 In reading this article, I know I have some ‘babies’ and will check this out further and put in pots, and yet either replant or bring pots in the fall. I have limelight in the front and pinks in the back. You can buy a product at Home Depot to get the colors to change based on the acidity in your soil. ENJOY! Hmm … love the idea of planting them and then pulling them back out in the spring. Of course, I’d be tempted to just leave them be in the ground and just pull out some babies. 🙂 I use that same acidifier from HD – good stuff. 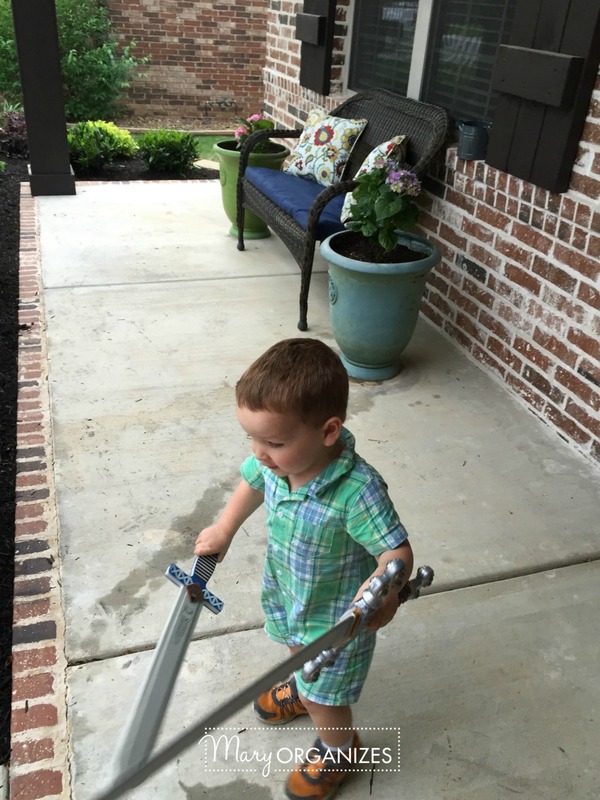 Thanks for your comment – love this story! So happy to hear there are so many hydrangea lovers out there! My favorite color is blue (although I appreciate all colors, Mary!) so what could be more wonderful than blue flowers?!?! They just give me so much pleasure! I have two bushes in my backyard that grow prolifically and produce gorgeous flowers, I am so excited to know I can retrieve some new plants from my original bushes and plant them into pots. How exciting!! And all without spending money. Thank you, thank you, thank you!! 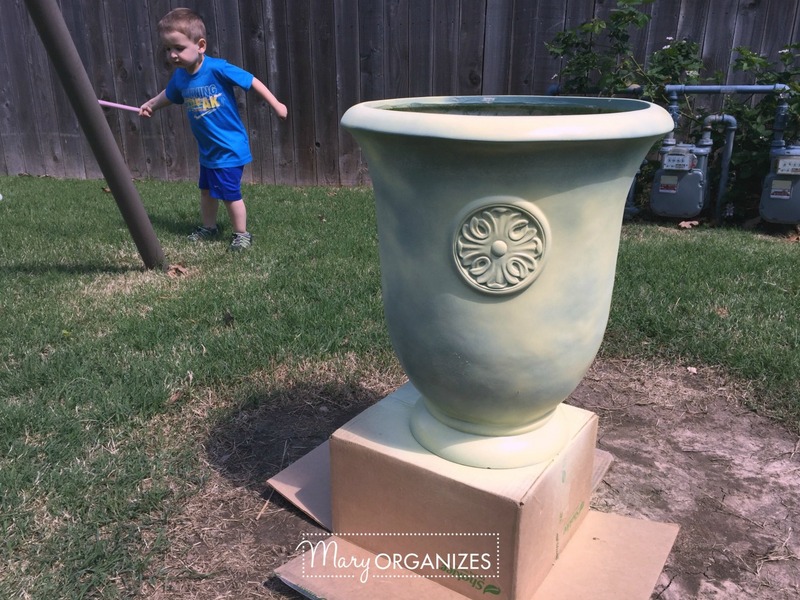 It is amazing what a coat of spray paint can do!